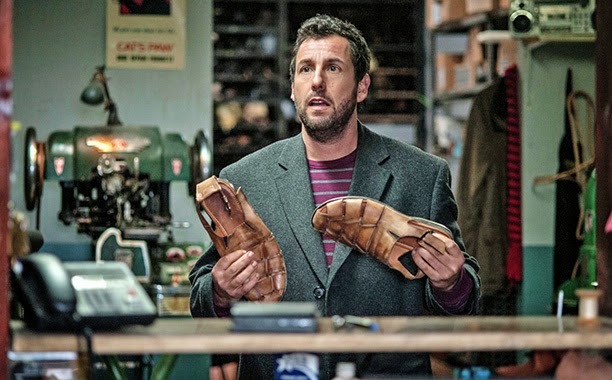 Two-time Academy Award winner Dustin Hoffman teams up with Adam Sandler in the heart warming comedy-drama “The Cobbler” directed by acclaimed and Oscar nominee Tom McCarthy(“Up”). for generations from his father (Hoffman). Disenchanted with the grind of daily life, Max stumbles upon an heirloom that allows him to step into the lives of his customers and see the world in a new way. Sometimes walking in another man's shoes is the only way to find out who you really are. Set in New York’s Lower East Side where the central character’s story has spent his youth and adult life. A character in itself, the setting, the diversity of New York and the history of the Lower East Side play heavily in the story. The movie starts in 1903 in a tenement building such it owes a lot to the history of that particular neighbourhood, something that’s constantly referenced in the movie, right up to the very last scene. The movie’s production designer Steve Carter, has created a place that felt like it had been there for one hundred and fifty years. “We had people walking in while we were shooting trying to drop off shoes, which I think is always a good sign. He really made a place that felt everyday and magical. And beyond that, we had so many different worlds that Steve had to create. And some of them more fantastical than others but always rooted in our reality. So there was a balance between the worlds. 12 different characters would also wear. It was fun to see that happening,” related director McCarthy on the film’s location and production. “The Cobbler” opens this March 11 in cinemas from Pioneer Films.